Today we proudly reveal a fresh new look for 5LINX. We have re-imagined the 5LINX logo and re-invented our tagline to reflect a new vision for our company. Your company. 5LINX has always been about opportunity… About empowering you to build a future for you and your family on a solid foundation. In other words, we have always been about helping you Build Your Legacy. This rebranding is the culmination of over 3 months of work. But it all started with a very difficult decision: Do we keep the 5LINX name? There were arguments to be made on both sides of that question. Ultimately, however, we decided that we are—and always will be—5LINX. We still stand for those 5 principles which we have held dear since 2001: Freedom, Integrity, Vision, Opportunity and Success. And we believe it is the sign of a strong company to face challenges head-on, and to keep moving forward with these principles as our foundation. I hope you’ll take a minute (and a half) to watch the video below. This is our story. This is our path into the future, and we want to travel that path with YOU. 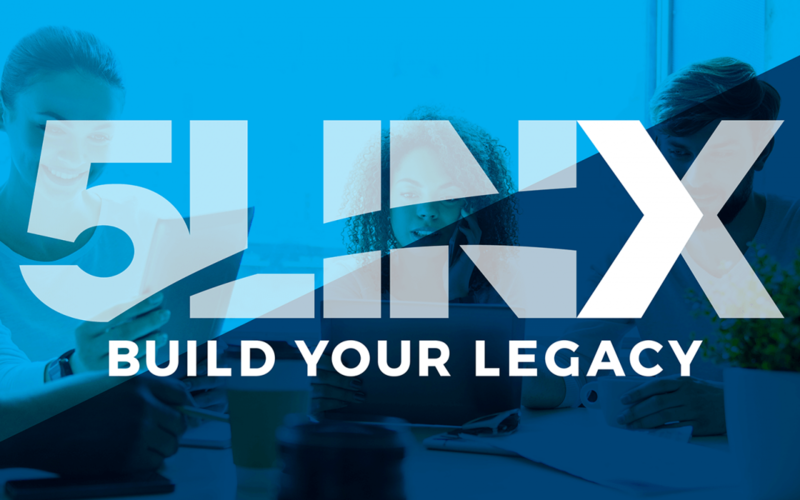 Build Your Legacy with the new 5LINX!